“You dirty, filthy pig! So, I belong with the freaks, huh? I’ll fix you so even the freaks won’t look at you.” Billed as the "world's first monster musical," this camp classic was shot in only 11 days with a budget of just $38,000! Directed by legendary low-budget auteur Ray Dennis Steckler (1938-2009), the flick was filmed in "Terrorama" (whatever the hell that is!) and most of the action takes place at The Pike, a now-defunct amusement park South of Ocean Boulevard in Long Beach, California. 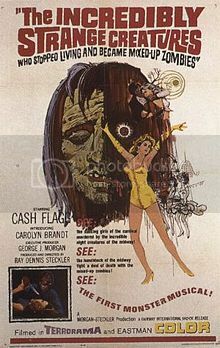 Although Incredibly Strange Creatures regularly makes it on "Worst Movies Ever Made" lists, it's definitely one of my guilty pleasures with its great title, carnival locale, strippers, musical numbers, incredible dream sequence, zombies and awesome final scene that takes place on a rocky beach! The eclectic cast includes Steckler (billed under the pseudonym “Cash Flagg”), Carolyn Brandt (who was married to Steckler at the time), Brett O’Hara, Atlas King, Sharon Walsh and Madison Clarke. In addition, James Woods was rumored to be an extra in the film. The tagline screamed, “A Horrifying Movie of Weird Beauties and Shocking Monsters …” Steckler also directed such unforgettable films as Wild Guitar (1962), The Thrill Killers (1964), Lemon Grove Kids Meet the Monsters (1965) and Rat Pfink a Boo Boo (1966), among many others. If you are a fan of extremely entertaining, low-budget films, I urge you to check them all out!